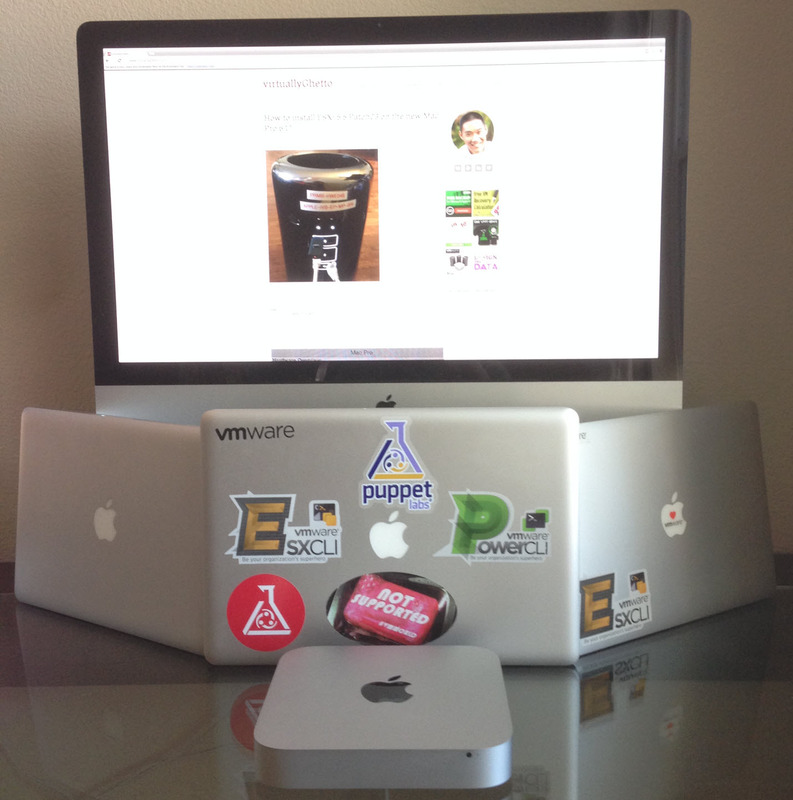 You are here: Home / Apple / Want to run ESXi on an Apple MacBook Pro, MacBook Air & iMac? #YesYouCan! We all know that ESXi runs pretty flawlessly (for the most part) on Apple Mac Pro's (5,1 & 6,1) and Apple Mac Mini's (5,x & 6,x), but what about when it comes to consumer laptops/desktops like a MacBook Pro/Air and even the iMacs? As you probably have guessed from the the title, you can run ESXi on any of these systems (which has been made easier with the latest ESXi release), in fact over the weekend I had some fun with some of the Apple hardware I had at my disposal. One of the issues I have encountered in the past when trying to install ESXi on my 15" MacBook Pro 8,2 (shown in the center of the picture) is that the keyboard (both the on-board and USB) would stop functioning once the ESXi installer started up. I could never figure out why and to be honest, I never really looked into the problem. I recently found out this issue has been resolved with the latest ESXi 5.5 Update Patch03 which also enables support for the new Mac Pro 6,1 and other bug fixes. It was good to learn from one of my readers, that the keyboard issue has been fixed using the latest 5.5u2 Patch03 image. If you look below, I actually went through and installed the latest ESXi release on each of these platforms which were all straight forward using a bootable USB key except for MacBook Air 6,2 which required adding the iovDisableIR=true boot option which I have blogged about here. Whether you need to run ESXi on server grade hardware like an Apple Mac Pro or a tiny and lower power platform like the Apple Mac Mini or a consumer laptop/desktop like MacBook Pro/Air or an iMac where ESXi can be available wherever you go which is great for frequent travelers. As you can see, you have plenty of options for running ESXi on Apple hardware! How to build custom ESXi ISO for Apple Mac Mini? Very interesting. Now I have an idea of what to do with my 13″ Macbook Pro (7,1) when I replace it. I can add an additonal ESXi host to my newly created home lab. William thanks for this blog. It helped me get started with a home ESXi lab on Apple hardware. Thanks again! 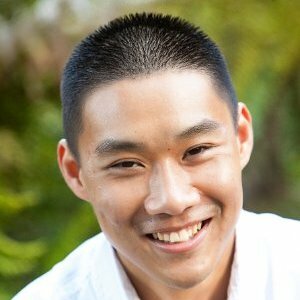 Which browser do you use on your Macs for running the vSphere Web Client? I am having the most success with Chrome. I could not get the console to load with Safari running on Yosemite. I pretty much use Safari most of the time and would like to use it for the vSphere Web Client, but it just doesn’t work. The vSphere Web Client seems to be the only reason for me to use Chrome now. I saw a post on the KB that a Linux user was having the most success with Chrome on Linux. Thanks. The console doesn’t launch for me either in Safari on Yosemite with the latest ESXi. I can’t stand the web console anyways though, I use VMWare Fusion for the console side of things with ESXi from my MacBook. Safari works fine in the latest version of esxi 5.5. I use it every single day with zero problems. I’m trying to reuse my old Macbook Pro 5,3 (mid 2009) as Hypervisor for tests. I’m trying to install VMware-VMvisor-Installer-5.5.0.update02-2068190.x86_64, but the installation doe snot recognise the hard drive. Are there any workarounds available? Did you get a fix for this?? I can’t get my HDD recognized either. Thanks so much for the information. 5.5u2 installer got stuck, used patch3 iso via your tutorial and worked like a charm. Do you know of a way to disable or blank the screen of your Macbook Pro while ESXi is running? 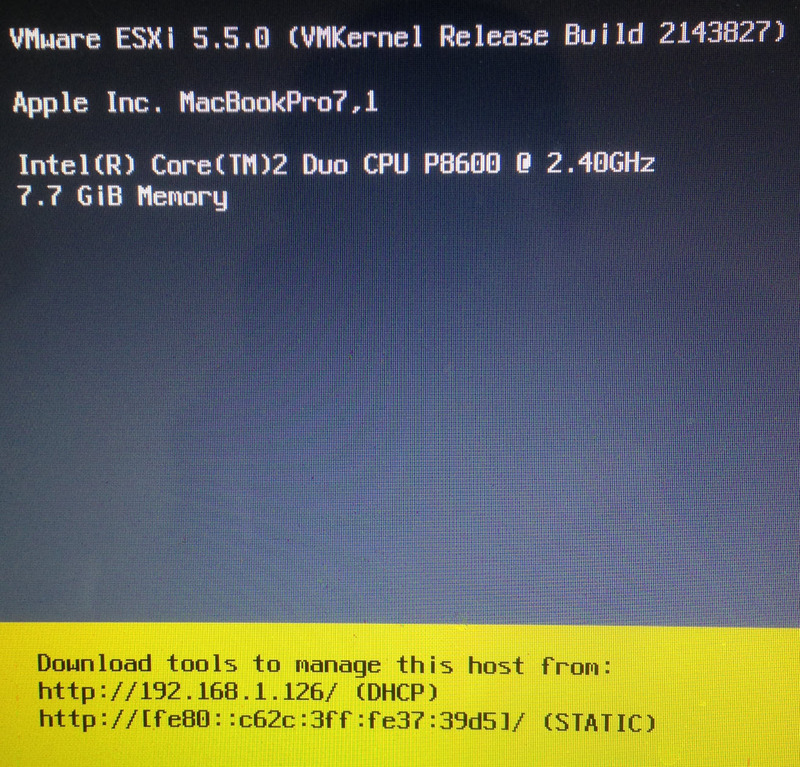 I figured out a way to keep the screen blank while running ESXi on a Macbook 5,1. Not sure if it will work for the Air or Pro. Power on your laptop and once you see the initial gray boot screen, close your laptop lid. Your Mac will continue booting into ESXi. Once ESXi has finished booting up, open your lid and there will be nothing on the screen. You’ll still be able to remotely manage the ESXi host as normal but your Macbook will essentially be running as a headless server. Hi, I was able to install ESXi 5.5u2 on Macbook Pro late 2008, and it comes up as MacBookPro5,1. Also, I assume that firewire connected drives are not supported either, is that correct? Note that I have 2 internal drives on this macbook – one is a 2TB drive in the DVD slot. I just tried installing ESXi 6.0 on an iMac 10,1 and the ESXi installer was not able to see the internal disk on the iMac. Next I tried formatting the drive FAT 32 (I don’t recall having to do this when I installed ESXi 5.5 Update 2 on my Mac Mini Server 6,2 ), and the installer still did not see the iMac’s internal drive. I guess ESXi is a no go for iMac 10,1 (3.06 GHz Core 2 Duo). No big deal, I just thought I would try to utilize some older Mac hardware. Will the screen remain on continuously when installing ESXi on an iMac? EDIT: I meant once ESXI is installed on an iMac, will the iMac’s display remain on continuously while ESXi is running? I have an iMac I want to use as another ESXi host in my home lab and plan to have it running 24/7. Not sure how the iMac’s display properties can be accessed once ESXi is up and running. Thanks for clarifying William. So I guess the one drawback to installing ESXi on an iMac is excessive wear and tear on the display, especially if one plans to run ESXi on the iMac 24/7. Hi William, I’m trying to boot from usb flash drive using the latest ESXi 6.0.0 (2015-03-12) on an Mid 2015 MacBook Air 7,2, but I’m hitting the ‘No network adapter’ error, even with the thunderbolt Ethernet adapter. Do you know of any workaround for this? 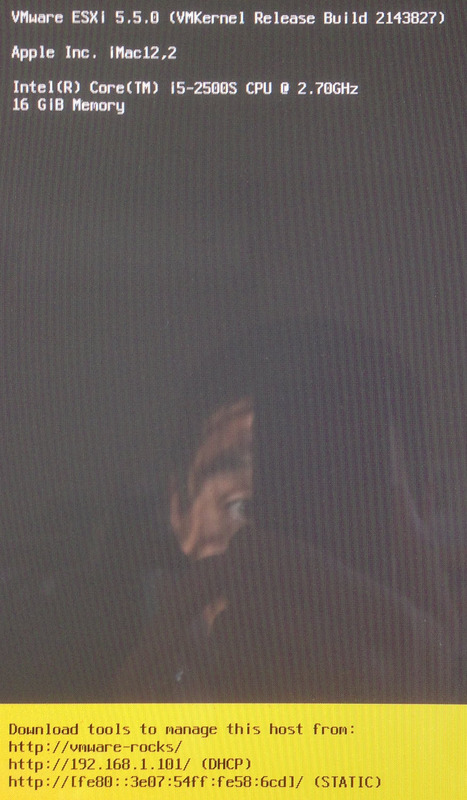 Also having this same problem but on a MacBook Pro Retina Early 2015. I tried creating a custom iso with esxi-customiser and adding the thunderbolt ethernet VIB but still get the no NICs found. I’d love to know how Will got it working on his MacBook Air. Perhaps there is an install check script that needs to be modified to remove the check for NICs? I would like to know if I can run ESX on MacMini 4,2 (mid2010). I tested official installers of 5.5.0 and 6.0.0 but got stuck – internal HDD not detected. I think I need to use customized .iso with proper SATA drivers (nVidia chipset). Would you mind to help, I am a beginner in this community. First thanks very much for the all the awesome blog posts. They’ve been really helpful. I’m having the same problem as danbridgland and hatingfruit. 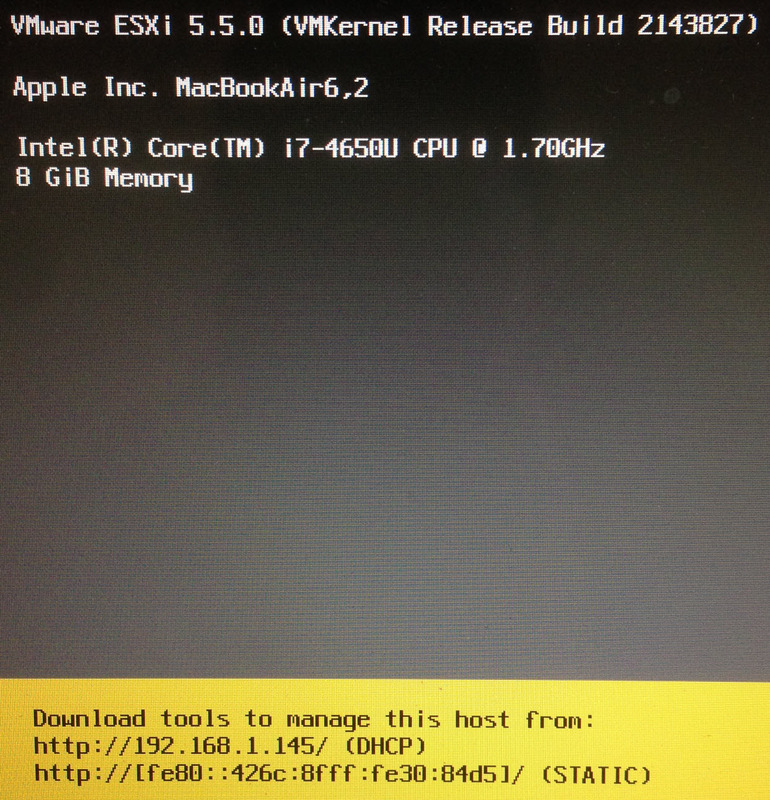 Have you been able to install ESXi 6.0 Update 1 on your Air? I’m having the same issue…if anyone figured out how to get it to recognize the Thunderbolt Ethernet adapter please post it here? I tried installing ESXi 6.0 update 02 on a MacBook Air 11″ 6,2 model, and the installer failed to detect the on-board 256GB PCIe SSD. It was able to detect a USB drive though, and I did an install on the USB drive. Is there a workaround to get ESXi 6.0 update 02 to work with this machine? Thanks! First of all thanks for your effort sharing your findings. 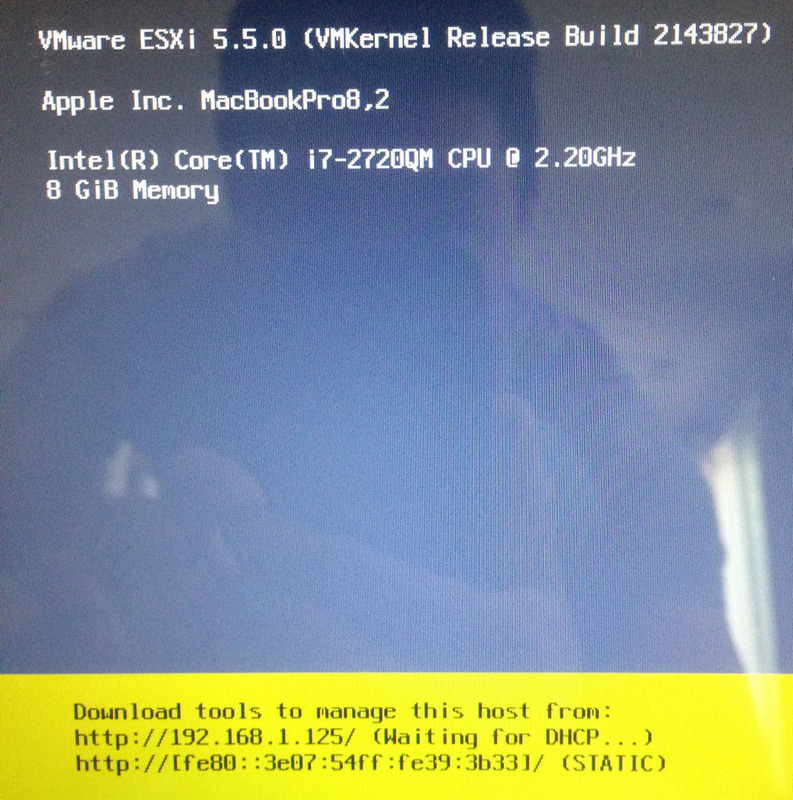 I am trying to run Esxi on a MBPro retina ( MBpro12,1). I am able to run Esxi 6 with the latests usb to ethernet via you created, but I am unable to run the thunderbolt ethernet drivers. I am able to create custom Iso files but the ethernet thunderbolt adapters are not getting recognized. What can be happening? I have the thunderbolt cables for long and they work fine. can they have a different chipset? Curious about what this does (if anything) to the original install of OSX- I have a Mid-2014 MBP – and I have SAN full of dev VM’s I’d love to have temporary access to. If I booted off an ESXi usb drive – would it hurt the OSX install on my MBP at all? Would I then be able to configure the lan port (actually its an apple USB/RJ45 dongle) and plug into a switch that also has the SAN connected? But after that the disk is not being recognized. Is there anyway this issue could be resolved please? I would like to know if you can do a side by side install of ESXi server on a macbook pro laptop with Sierra OS running? So basically reFind boot manager will be installed so in order to choose which OS to run. I would like to know if I can do that? Or I won’t have any choice but to erase my Sierra OS and install the ESXi on it and just install guest Sierra OS in order to run again an apple OS? I was able to install ESXi6.5U1 into MacBookPro 6,2 (Mid-2010 15inch) with the workaround in this post. The iovDisableIR=true boot option is not required. Thanks for this, how does one create the bootable USB stick? I had tried to format mine as a FAT32 drive with the partition map (as apparently Apple won’t boot without that) but when I used Etcher to convert the VMWare ISO it warned me that the ISO didn’t contain a partition map and would likely not boot. I tested and it was correct. So how do you create a bootable USB stick containing the VMWare image that will boot on a MacBook?